Hakainde Hichilema (born June 4, 1962) is the President of Zambia’s United Party for National Development (UPND). He replaced Anderson Mazoka after an interparty election, organized by then functioning party president Sakwiba Sikota, which followed Mazoka’s death in May 2006. 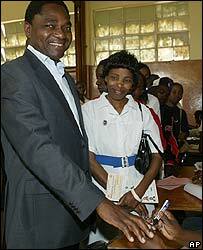 He is also President of the opposition alliance United Democratic Alliance (UDA) which comprises FDD, UPND and UNIP. Mr. Hichilema popularly known as Sammy by his close associates is married to Mutinta Hichilema and they have three children, daughter Miyanda (12), and sons Habwela (9) and Chikonka (6). He is a graduate of UNZA where he studied economics and business between 1981-1986 after which he went to the United Kingdom where he did his Masters in Business Administration – MBA. 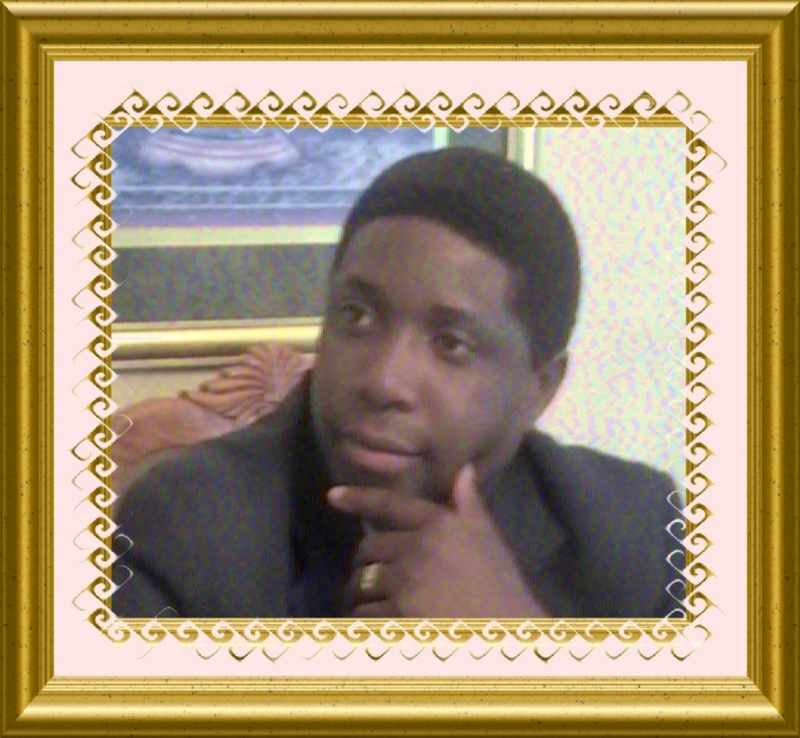 His professional career includes positions such as assistant consultant at Equator Advisory Services. At Coopers & Lybrand he held various positions including that of director, corporate advisor and he also served as CEO from 1994-1998. When Coopers & Lybrand changed its name to Grant Thornton, he was named Managing Partner of the firm. Mr. Hichilema is Chairman of the board(s) for Sun International, Greenbelt Fertilizers Ltd, Media Trust Fund, Export Development Program and sits on various boards as director including the Zambia Investment Board, Seedco Zambia, African Financial Services Limited, Zambezi Nickel or Bermuda Limited (Bermuda) and West Lake Investments (Mauritius). He also sits on seven other boards in member capacity which include but not limited to the Zambia Association of Chambers of Commerce and Industry, Zambia Business Forum, etc. As a presidential candidate for the United Democratic Alliance (UDA) he ran against incumbent president Levy Mwanawasa of the Movement for Multiparty Democracy and Patriotic Front candidate Michael Sata. Mr. Hichilema received the endorsement of former president Kenneth Kaunda. The elections were held on September 28, 2006, and Hichilema took third place with about 25% of the vote while other estimates say he actually come in second when the final tally is scrutinized. In this week’s memo, he is being contrasted with Mr. Michael C Sata whose profile was posted against Dr. Lewanika and we don’t see any sense in us reposting it. We hope pundits will look at a veracity of issues pertaining to both qualities as well as qualification of who we should put forward as the nation’s chief executive officer for the Zambian Enterprise in these perilous times. THE United Party for National Development (UPND) has decided to attend the National Constitution Conference (NCC) and fight for a better Republican Constitution within the conference. UPND President Hakainde Hichilema said in Lusaka yesterday although the party was not happy about the Government’s refusal to amend the NCC Act and address various concerns, it decided to attend the NCC in the interest of the nation. Speaking during a Press briefing at the UPND secretariat, Mr Hichilema said the UPND National Management Committee (NMC) resolved that the party should continue fighting the battle of the Constitution within the NCC, the referendum and finally in Parliament. “At the level reached in the Constitution making process, our party’s NMC which met on Friday December 7, 2007 decided to carry the fight into NCC.“As a party, the UPND will continue to act as a whistle blower in the Constitution making process and fight any machinations to make a bad Constitution for the people of Zambia,” he said. Mr Hichilema said when the NCC Bill went to Parliament, UPND moved amendments to take into account stakeholders’ concerns.He said the concerns were, among other things, the need to increase the composition of the NCC and include those who decided to stay away. “In our attempt to achieve amicable resolution of outstanding issues which many stakeholders felt were not addressed in the NCC Act, we also held meetings with the Ministers of Justice, Information and Lands. “Subsequently we wrote letters to the Head of state dated October 9 2007 and a reminder dated November 18 both of which were not responded to,” he said. Mr Hichilema said the UPND members of Parliament (MPs) and councillors would fight for the interests of the Zambian people.He said the UPND had been consistent on the Constitution making process and that it wanted a Constitution that would stand the taste of time. Mr Hichilema said at the NCC, the party would fight among many other things, that the republican president should be elected by 50 per cent plus one of the valid votes.The election date, Mr Hichilema said, should be enshrined in the Constitution and that the Electoral Commission of Zambia (ECZ) should be independent. He said stakeholders such as the Church and non-governmental organisations (NGOs) should be represented on the ECZ, as was the case in South Africa and Mozambique. “The Chief Justice should not be the returning officer for the presidential elections, but the chairperson of the independent electoral commission,” he said. The UPND also recommended that there should be a mixed proportional representation system of elections to Parliament. Mr Hichilema said MPs defecting to other political parties and creating unnecessary by-elections should not be allowed to re-contest their seats for the remaining life of that Parliament. Chief Government spokesperson Mike Mulongoti welcomed the decision by the UPND.Mr Mulongoti said, however, it was sad that the UPND had taken a confrontational stance on the NCC by saying that it would give the MMD a good run in the Constitution making process. “For us as Government we welcome the participation. The spirit should be for people to go to the conference. It is about making a law and the MMD is going there just like any other party,” he said. Following our last memo on Maureen Mwanawasa As Zambia’s First Female President a lot of interest was generated as to what the qualifications for the CEO of the Zambian Enterprise should be. There are a lot of variables in play that make up the right mix to that ascension, however, and we would like to explore some of those in this week’s memo. There are only two primary qualifications; one being one’s age and the other one’s nationality as dictated by our current constitution. Others are predicated upon a fundamental concept of systems theory, a way of thinking about the world, a model that is followed wherever party politics are practiced. With the above in mind the rest are up for the grabs and whoever can work the system to the fullest extent apparently ends up being the president of the Zambian Enterprise. We say working the system because that’s exactly what it is. A system is a set of interacting or interdependent entities, real or abstract, forming an integrated whole. Being man-made systems, democracies normally have certain purposes and or objectives. They are designed to work as a coherent entity and whoever aspires to the office has to have a good understanding of their operational capacities. Systems are determined by choosing the relevant interactions we want to consider, plus choosing the system boundary and or, equivalently, providing membership criteria to determine which entities are part of the system, and which entities are outside of the system and are therefore part of the environment of the system. There are also closed systems and open systems but in a political environment one has to work within a closed system called a political party. It is no wonder no one wakes up and says he would be president tomorrow because a system has to be in place for one to achieve such an objective. Now, within a closed system are also other variables to consider such as membership, name recognition, positioning, timing, synergy and a whole lot others. While membership and name recognition are the basic requirements, positioning and timing feed on each other to be functional. Synergy on the other hand is group determined, in other words the people within the system decide to choose leadership based on the maximum good for the collective. It is at this stage that they look at one’s qualifications; academic, professional and or otherwise as the best sale for their franchise. What we see in the first lady is her ability to work the system if she wants to be the next CEO of the Zambian Enterprise and with all operational capacities in place, the MMD as a franchise can provide her the nomination which is hers for the taking unless of course she is not interested. So, with all the bluff and fluff about qualifications, it is all back to the basics otherwise we could have had the most educated and or professionally qualified person as the president of the Zambian Enterprise by now. Lastly, any such person wanting to make the grade can only be successful if they realized the importance of working within a system and that’s this week’s memo from us at the Zambian Chronicle … thanks a trillion. 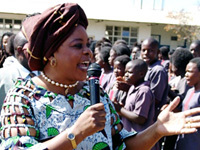 Can Maureen Mwanawasa be Zambia’s first female president? We think so!!! 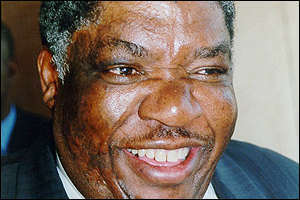 Recently during the cabinet reshuffle HE Levy P Mwanawasa, SC. encouraged NEC (National Executive Committee for the MMD) to start thinking about his successor. Dr. Mwanawasa also mentioned that he had someone in mind that he felt NEC would have no objections to … whoever that person is and or could be, we at the Zambian Chronicle are not privy his choice. But with the advent of female presidents around the globe, we think that the First Lady would have an easy sail through the MMD nomination process. There are several reasons why this might happen among them being that Dr. Mwanawasa’s popularity is at an all-time high within the Zambian Enterprise. Thus at the end of his term, it goes without saying that whoever he endorses would carry the day as his successor. 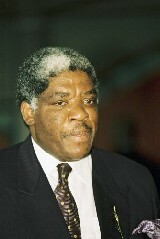 The other reasons are but not limited to the fact that, we Africans seem to love continuity more than change and should the current first lady be interested in running for State House, more of the president’s supporters would feel more comfortable with that scenario as they would still envision Dr. Mwanawasa at the helm. Also, world trends seem to be moving in that direction. In Argentina, former first lady Cristina Fernandez de Kirchner won the country’s presidential election in a peaceful vote, while Hillary R Clinton might be the first female US president next year in what may be one of the toughest races in history. 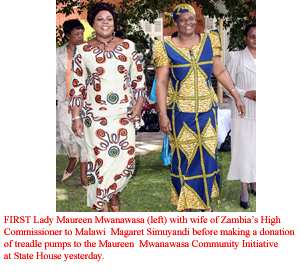 Should Mrs. Mwanawasa seek the nomination, she would have a lot of things working for well for her. Among other things unlike our first two first ladies, she is more up to the task, educated, articulate, more diplomatic as well as presidential. She is seen from inner circles as the brain behind a lot of good initiatives in the current administration and she is very likeable. Did anybody remember what today is? It is September the 28th and the smart people of the Zambian Enterprise went to the polls a year ago. 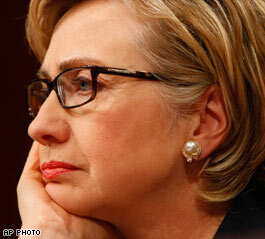 It was a frenzy day, all the candidates had put in their very best, and their machineries were sitting at the edge. The air was ecstatic, some tempers high in certain places and the world was watching … No one knew for sure who that actual victor would be … it ended up being the incumbent recapturing the crown. We were the first ones to congratulate the president for his sweet victory even if our candidate of choice was HH for stood under UDA auspices. We are the first ones today to wish the president God speed on this first anniversary of his sweet victory in consolidating his party’s lead offering the much-needed leadership. We have watched the president grow in eminence and grow comfortable in the job … Meanwhile, according to ZNBC 250 members of the ruling Movement for Multi Party Democracy (MMD) who include the entire district committee in Chongwe in Lusaka province, have defected to the opposition UPND. Nevertheless, MMD chairperson for elections and chief government spokesperson Mike Mulongoti said while the cadres are exercising their right to join a party of their choice, the ruling party will probe the cause of their defections. Former Chongwe District MMD Chairperson Willie Shaila led the defectors. Mr Shaila said the ruling party was dead in the district hence their decision to defect. And receiving the defectors at Chongwe grounds, UPND president Hakainde Hichilema said the opposition party is committed to poverty eradication. Mr Hichilema said the UPND has room to accommodate 12 million Zambians. When contacted for a comment, Mr. Mulongoti wished the defectors good luck saying it is their democratic right to do so. Mr. Mulongoti said the defections are not good riddance, as the ruling party will investigate why some of its members have defected to the opposition. Mr. Hichilema has been doing a lot of things right since the last election and like president Mwanawasa has grown on the job, we continue to see him growing into a formidable “politician” – it is not enough to be a good leader with weak political acumen. 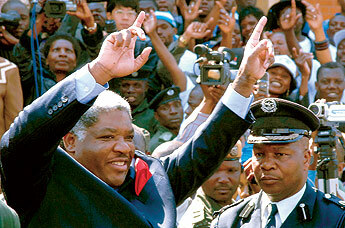 He recently donated vehicles to continue mobilizing and growing his party. He continues to grow more and more comfortable being a leader of party with fresh growth coming up and come 2,011; we see an appealing contender with the ability to be the next president and that is this week’s memo from us at the Zambian Chronicle … thanks a trillion. He finally jetted in Friday afternoon and Zambia had her weekend romance with Bill Clinotn. Upon arrival the former US president toured the warehouse with Philippe Douste-Blazy, chairman of the board of UNITAID, an organization formed last year by France and 19 other nations that have earmarked a portion of their airline tax revenues for efforts to fight HIV/AIDS in developing countries. 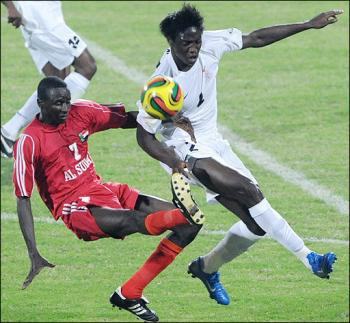 From there he went to a soccer tournament with former President Dr. Kenneth Kaunda. Super Ken went ahead and presented a neckerchief to him; Clinton tore off his red tie and put on a green, red and yellow Boy Scout neckerchief presented to him by KK. At the tournament, the crowds and dignitaries were ecstatic as the young lads were having a bowl while as per his usual personality had to merriment them charmingly … “Most of the people in Africa, and in the world, who have the HIV virus … do not know it,” Clinton quizzed. State House was eagerly waiting and he finally arrived at 14:35 Zambian time on Saturday as Zambian officials vied for photos with him some complimenting him for his leadership … “You were great in office, and you are even greater out of office,” Zambia’s health minister, Brian Chituwo, said in a speech. President Clinton appended his autograph to the State House guest book and had over an hour closed-door meeting with HE Levy P Mwanawasa, SC. Zambian dignitaries in attendance included Foreign Affairs minister Mundia Sikatana, Zambia’s ambassador to the United States Inonge Mbikusita-Lewanika and other senior government officials. After his meeting at State House, President Clinton arrived later on Saturday evening at Arcades Mall around 19:30 for an unannouced dinner. Shoppers were thrilled to see the former leader of the free world and an excitement frenzy enthused. It was a rockstar moment; President Clinton left immediately after dinner. He jetted out this afternoon for Tanzania where he held meetings with political leaders on the mainland and in Zanzibar in an effort to break down the remaining resistance to expanding AIDS initiatives. Zambia and South Africa fall under the “Procurement Consortium Group” while Malawi and Tanzania are under the “Partnership Group” within the Clinton Global Initiative strategies. 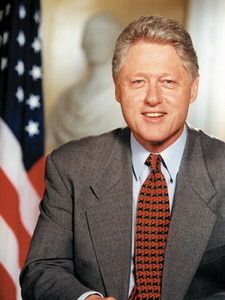 President Clinton is expected back in the United States of America by Tuesday and the Zambian Chronicle wishes him God Speed and a safe trip back home … thanks a trillion. MMD government scored the lowest grades ever … way below an “F” when it comes to spending on education as a percentage of GDP. This is according to the recent World Bank Report on Zambian migration – causes and effects. Under the UNIP government, education was a real priority and it averaged between 15-20% as a percentage of GDP. “The current skill shortage in Zambia is primarily due to inadequate educational infrastructure and cannot be solved merely by restricting skilled emigration. 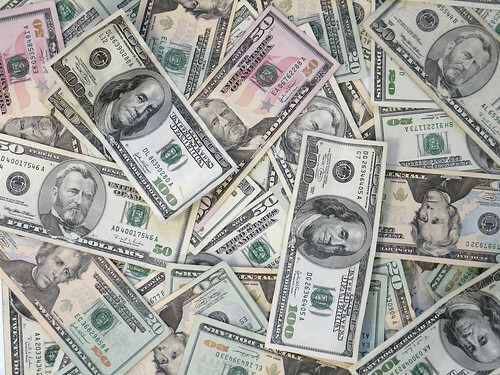 Government expenditure on education is currently only 2% of GDP, the lowest in Africa and well below the 3.4% average level for least developed countries.“ – reveals the Report. Just how do we expect the country to move forward … with the current scenarios in place, once all the UNIP educated nationals retire, Zambia will have less skilled manpower of any country on the continent. This is because at least 50% of all graduates leave the nation for greener pastures and there seems to be no aggressive action plan to retain them and or repatriate those abroad back home. John F Kennedy once said, “…let us think of education as the means of developing our greatest abilities, because in each of us there is a private hope and dream which, fulfilled, can be translated into benefit for everyone and greater strength for our nation”. For us at the Zambian Chronicle, education is the fuel that powers innovation and poverty thrives on lack of it. By the time the Mwanawasa administration is over, the MMD would have been in power for 20 years with no new universities, no new colleges; and yet UNIP built all the technical colleges in every province and 2 universities in 2 major hubs within 27 years of leadership. How can you develop a country despite all the goodwill if the locals have no clue how? It is no wonder 68% of our people are still living below the poverty datum line 16 years after the MMD took office according to the same report … thanks a trillion.